Have you noticed that there’s been a huge dearth of wrestling games over the past five years or so? And that even the WWE has been reduced to putting out only one game a year? Well, that’s precisely because wrestling games tend to follow along almost exactly with the boom and bust cycle of the wrestling industry as a whole. The wrestling video game output is low because of the rut the whole industry has been in since WWE became a monopoly. A similar dearth happened in the mid 1990s, when both the WWF and WCW were struggling to stay relevant. Conversely, the biggest boom periods in wrestling also have seen the biggest outputs of wrestling video games. It happened at the height of the Attitude Era in 2000, and going even further back, it happened in the early 1990s, during the peak of Hulkamania. The time period from 1991 to 1992 saw the WWF ride the wave of the evolutions in video game technology to put out no less than an entire family of three related wrestling games, each developed by Sculptured Software and highly similar in their music, rosters, gameplay, and presentation styles. The Game Boy had WWF Superstars 2, the NES had WrestleMania: Steel Cage Challenge. 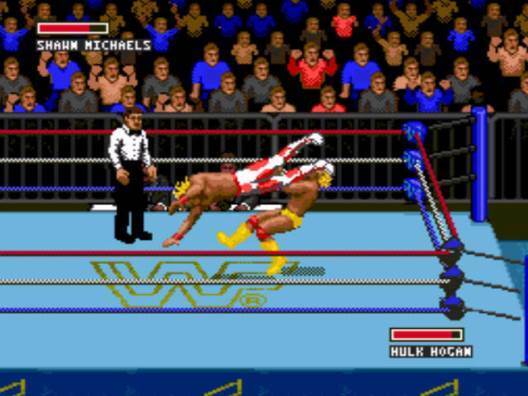 But most importantly, the WWF was making their 16-bit debut with WWF Super WrestleMania. The SNES and the Sega Genesis would see the aptly named Super WrestleMania become the first in a trilogy of 16-bit WWF games that would be the most prominent American wrestling game series of the early 1990s. Taking advantage of the jump in technology, this game would incorporate smoother animations, a more atmospheric presentation, and more sophisticated match options. Would these efforts succeed in creating a fun, engaging wrestling game? Strangely, the short answer is: Yes and no. Super WrestleMania begins with a straightforward intro to the wrestling options. You set up your match, choose the difficulty level, and hit the ring. The in-ring presentation is simple, yet effectively stylish; the participants are each introduced via beginning text intros by an animated Howard Finkel, the arena looks nice, a referee is inside the ring at all times to follow the action, and you can even see animated versions of commentators Bobby Heenan and Vince McMahon in the background. The graphics are quite good; the renditions of the wrestlers are colorful and mostly accurate, and while the movements are a little jerky, they’re for the most part well-animated. In terms of wrestling gameplay, this game would introduce what has since become known as the “tug-of-war” grappling system; when you lock in a grapple, it becomes a test of strength between you and your opponent to gain the advantage and be the one to execute a move. In order to win the grapple, you need to tap your button furiously so that you can overpower the other wrestler, allowing you to execute moves like slams, suplexes, headbutts, and Irish whips. It’s a straightforward concepts, and for the most part, it works well, although you can sometimes be surprised by how quickly your opponent can overpower you and gain the advantage, keeping you on your toes. Move sets, unfortunately, are very basic and similar for all wrestlers. In addition to the standard one on one and tag team matches, the game also boasts a nifty advance in wrestling gaming: A legit WWF Survivor Series match. 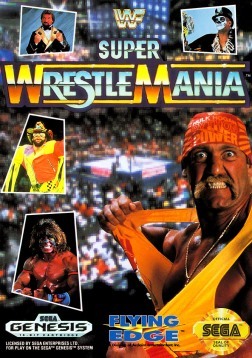 Super WrestleMania was not the first game to take a crack at presenting the WWF’s unique team elimination battle; WrestleMania Challenge for the NES had taken the first shot at it. But, as you would expect, it was limited in that game: You only had the capacity for teams of 3 vs. 3, and you were forced to cycle through your partners depending on the order you had selected them in. Super WrestleMania, however, manages to pull it off right. Yes, the Survivor Series match in this game is 4 vs. 4, just as it’s supposed to be, and on top of that, you are able to tag in whichever partner you want, without being constrained by the order. It’s a simple, yet elegant solution: There is one partner standing on the apron at a time, yet all you have to do is simply press the Select button to change which of your Survivor Series teammates is the one standing on the apron, leaving you free to choose who to hand the match off to at your leisure. It’s an innovative solution that pays off in what can be an exciting, crowded match. You are even able to break up pinfall attempts in tag matches; when your wrestler is being pinned, you will temporarily take control of your partner, who you can have come into the ring and stop the pinfall. So far, then, you may think that I’m describing what sounds like a solid, if simple, wrestling game. Maybe it’s a little limited, gameplay wise, but it has some pretty cool ideas and nice presentation, and overall, it sounds like a fine outing. And to an extent, you’d be right. But then, you get to talking about the differences between the Super Nintendo and the Genesis versions. And suddenly, it gets complicated. In modern gaming, when the same game is released on two different consoles, it generally does not make too much of a difference which console you buy it on. Sure, there may be some differences in graphical capability or game speed, but in general, you won’t have too different of an experience if you play the Nintendo 64 vs. the PlayStation version of WWF Attitude, or the PlayStation 3 vs. Xbox 360 version of WWE ’13. Such is not the case with Super WrestleMania. Your mileage will vary greatly depending highly on which console you have for it. And this aspect presents some major frustrations from a gaming perspective, and a huge dilemma when it comes to reviewing it. You see, Sculptured Software changed things up between their releases of the SNES and Genesis versions. The first difference you notice is the roster; the two versions have vastly different wrestlers featured. They both have three in common: Hulk Hogan, “Macho Man” Randy Savage, and Ted Dibiase. But other than that, the cast of characters is significantly different. In addition to the three mentioned previously, the SNES game features The Undertaker, Jake “The Snake” Roberts, Sid Justice, The Legion of Doom, and The Natural Disasters. On the other hand, the Genesis version has The Ultimate Warrior, Papa Shango, Irwin R. Schyster, The British Bulldog, and Shawn Michaels. It’s a peculiar move. I suppose it was some marketing ploy, sort of a, “Collect them all, kids, or you’ll miss out on playing as all the wrestlers!” deal. But so what, you may ask? The wrestlers’ move sets are all the same, anyway, so it doesn’t make too big of a difference, except for who you appear as. Besides, that means that the SNES roster has 10 wrestlers to the Genesis version’s 8, so the advantage goes to Nintendo! Yeah…this is where I get to undoubtedly the most baffling difference between them. The Genesis version has finishing maneuvers. The SNES version does not. I literally struggle to find the words to express how I feel about this glaring inequality. WHY? Why would Sculptured do such a thing!? I can understand differences in graphics, and hell, however gimmicky it is, I can accept different rosters. But why would you deprive SNES gamers of one of the most fundamental features of an exciting wrestling game: The chance to have a different wrestling experience depending on who you play as, and feel like you’re taking control of your favorite individual wrestlers!? The SNES version of Super WrestleMania isn’t a bad game itself, but when you compare it to another version of the same game which manages to have such a step up above it, those of us who stuck with Nintendo had to have been feeling like chumps, to say the least! It makes the SNES version seem so limited and bush league in comparison; I feel short changed for having gotten that version, since I know that if I had just chosen the other console, I could’ve had a much more unique and interesting wrestling experience. If that weren’t enough, the Genesis version also features an additional game mode: A Championship where you face all the other wrestlers in a quest for the title. Again: This is a simple addition that nonetheless manages to make the game much more interesting, and yet the SNES version is denied it. I just don’t get it. It’s this factor that makes judging WWF Super WrestleMania such a conundrum for me. On one hand, the developers did a good job with the overall game and the things the two versions have in common. But when you think about what they don’t have in common, all you can see are the mind blowing decisions they made in concluding that it would be a good idea to make two versions of the same game so lopsided and unequal. I played the SNES version, and I want to like it; it really was a solid first outing on its system, and presented the first of what would be a solid series for the 16-bit era. But it’s just so ridiculously overshadowed by its counterpart, that now I can’t help but feel disappointed in its limitations. At the end of the day, though, I need to reach a solid conclusion for the purposes of this review. And while I have to take a lot of points off of the game for how inconsistent the two games are, the only thing I can do is try to look at the general package the games present. In the final analysis, I will say that, for all of its limitations and frustrating inequalities, WWF Super WrestleMania nonetheless was an impressive first step toward a new chapter in wrestling gaming. It looked good, had a nice atmosphere, offered some new ideas, and had an accessible, playable new gameplay style. It needed improvement, and Sculptured really needed to learn from this and make the two games more similar to each other. But it was a start. The potential was there. These days, both versions pale in comparison to their two successors, but for its time, Super WrestleMania was a legit game which provided a good foundation for future outings.